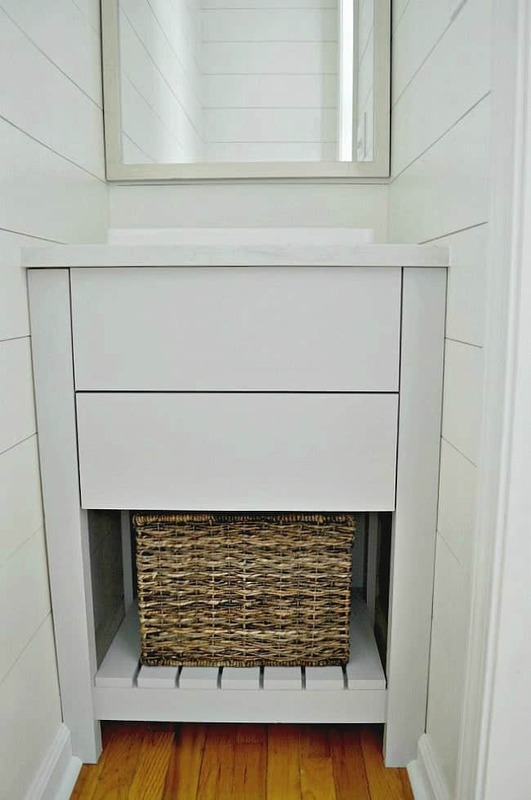 Turning a bedroom closet into a tiny powder room. 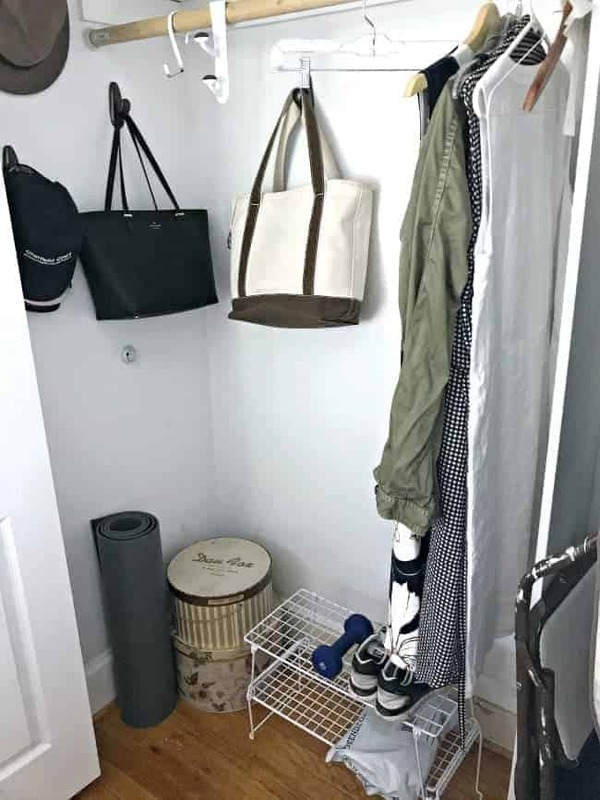 I shared the new closet reveal last week and today it’s time to share our brand new small powder room. I’m also sharing a video of the new powder room so make sure you check it out at the end of the post. Let’s take a quick look at where we started. This is the closet that’s in our guest bedroom, which is not original to the house. We’ve talked about adding a powder room to our cottage since we moved in and this closet seemed like a good spot. 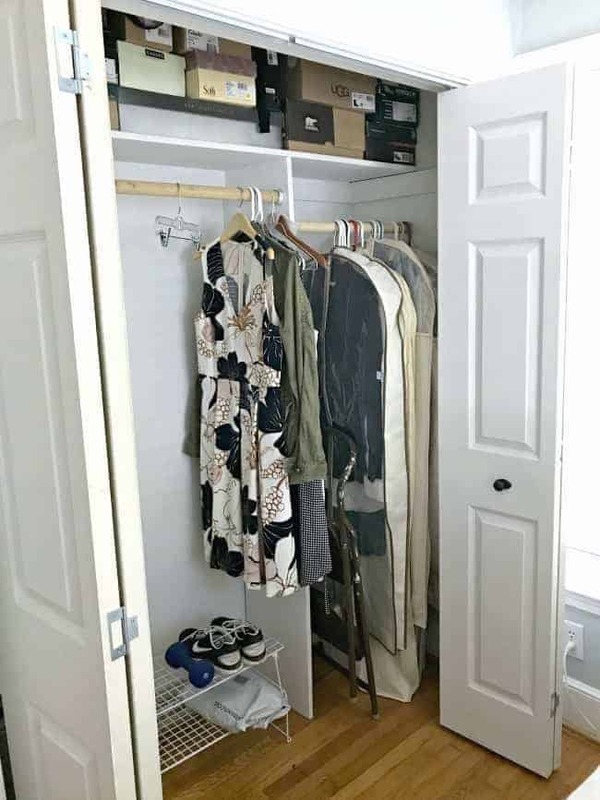 It’s actually our largest closet and is right next to the only bathroom, the perfect spot to tie in the plumbing. It took a while for us to plan everything but once we felt comfortable with our plans, we quickly got to work framing it out and wiring it. 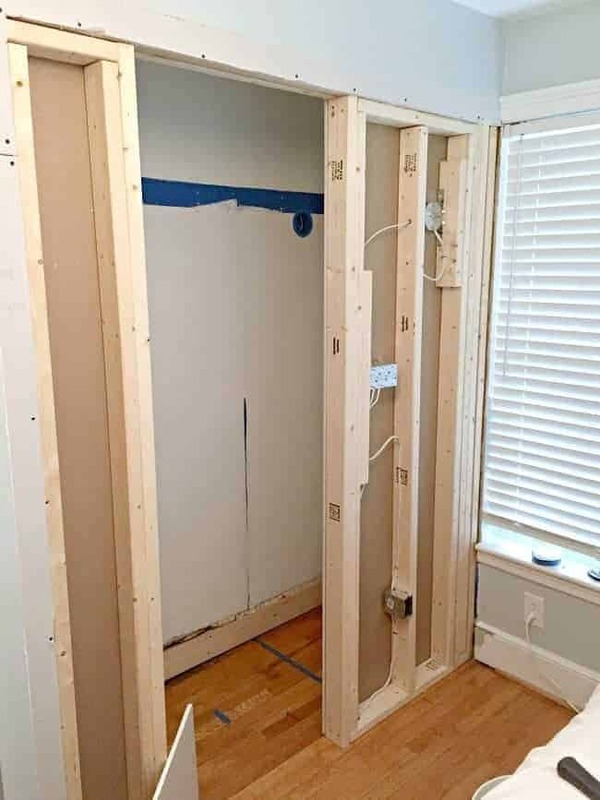 Check out the whole process of starting the powder room and building the DIY vanity. 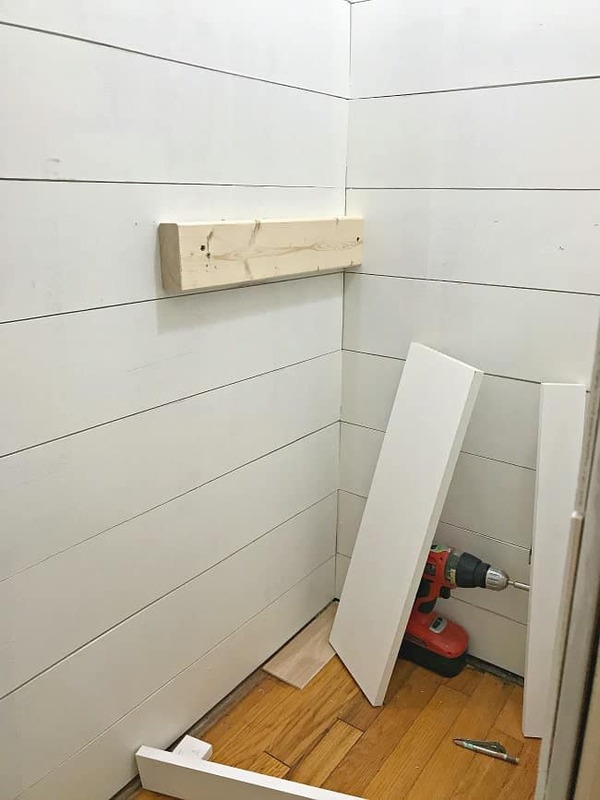 We added DIY shiplap to the walls and built a custom vanity. 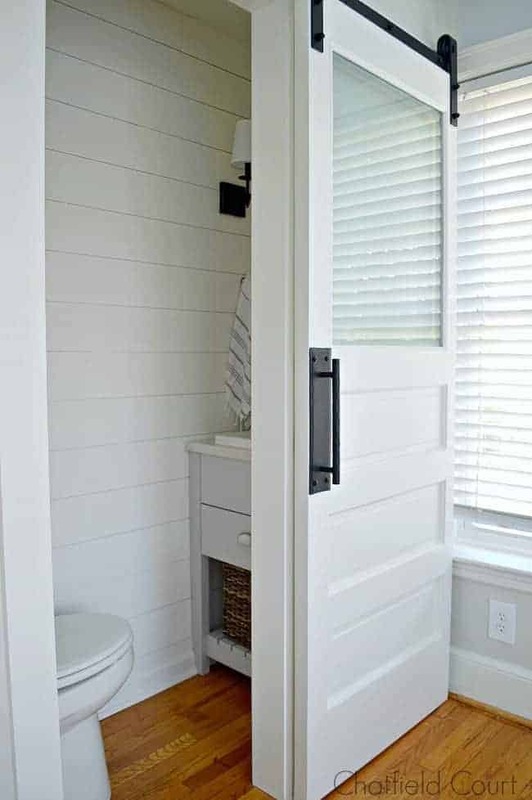 Most of the surfaces in this space were painted in my fave paint, Benjamin Moore White Dove, Advance, Satin, including the DIY shiplap, ceiling and barn door. Best. paint. ever! 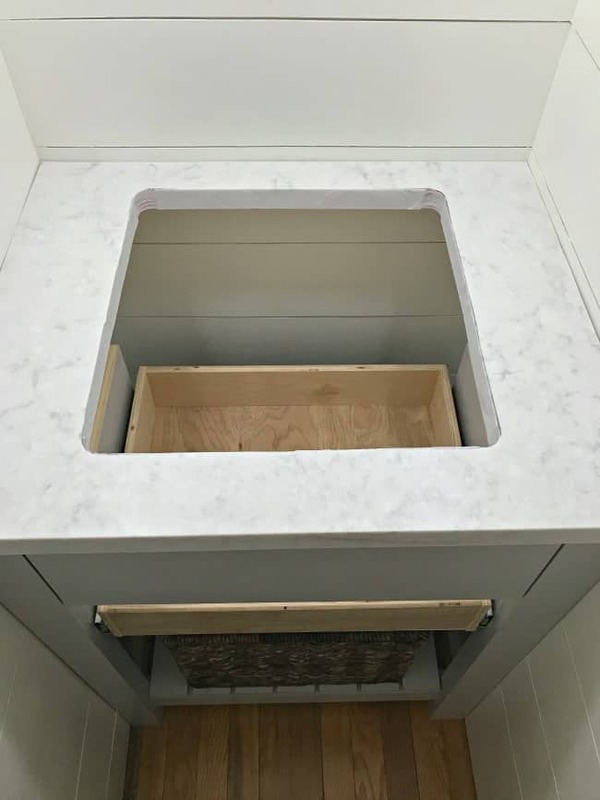 Once the shiplap was up and painted, we had to build the vanity in place. Uneven floors, plus a tight space, meant we had to do it this way. After the new powder room vanity was complete (and our new Moen faucet was installed), our work came to a standstill. We needed to replace our 80 year old plumbing so that we could hook up the new toilet. We’d never tackled a project like that before so it took some time and a bit of research. Once we tackled the plumbing though, we picked out a toilet and continued with the build. Picking the toilet for the new powder room was a job in itself. It had to be a certain size so it would fit in the space, and actually allow you to sit on it without smacking your head on the vanity. I never thought I’d be so excited to see a toilet. There isn’t a whole lot of space but it’s just enough….just. Our daughter came for a visit in December and used this space. She gave it 2 thumb’s up and said she had more than enough room. She still had to use our main bath to take a shower but that was it. It feels like a real luxury having this extra space, even though it’s tiny. I’m really loving our brand new space but can we talk about our new powder room door? I’ve been waiting 3 years to use this beautiful door. I’m so glad that I was able to use it here. I found this door on it’s way to the curb when the hubs and I were taking a walk in our Illinois neighborhood. To say I was excited is an understatement, I may have even squealed. After making sure that it was actually going out to the trash (it was), I ran home to get my car so we could haul it home. Hubs had the job of standing on the sidewalk, with his hand firmly grasping it, in case any door snatchers decided they wanted it. I’m happy to say that we got it home safely. It even made the trip to North Carolina, where it’s been waiting for its reincarnation. 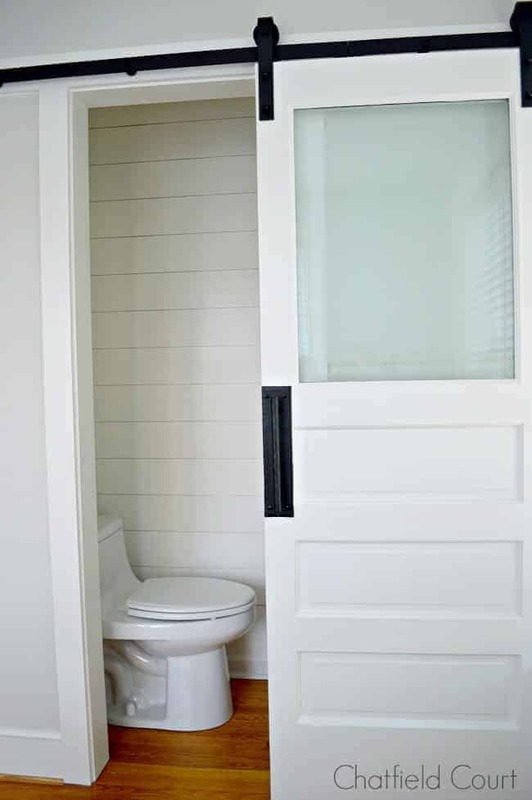 Let’s talk about using a door with a window in it for a bathroom. I really wanted to use a door that had a window in it so you didn’t feel like you were in a small, dark box when the door was closed. The hubs made it a point to keep reminding me that a window wasn’t a great idea when you need privacy. Clearly, I didn’t listen. I thought it would be ok because this space is in a bedroom so it’s a little more private. Plus there’s no traffic walking by while you’re using it. To add a sense of more privacy, and to make him happy, I used frosted glass spray paint. You can see the video I made when I was doing this project, here. I think the door with a glass window was definitely the right call. I’m loving the way it turned out. Thanks so much for coming along on this journey. All the work we put into our new small powder room, and the closet, was well worth it. I never expected it to look this good. Now we have to finish the guest bedroom. It’s never-ending. 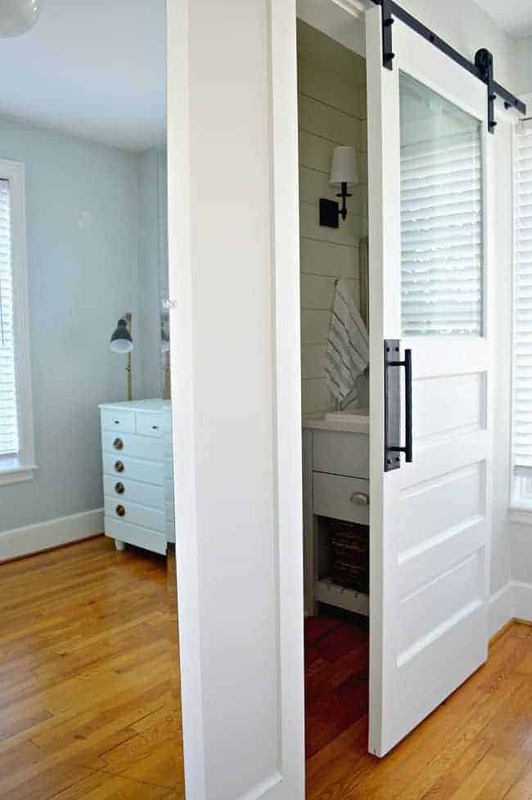 Have you seen the new bedroom closet that we built next to the shiny, new powder room? You don’t want to miss it. We couldn’t leave the rest of the room in shambles so we performed a little guest bedroom makeover magic. Absolutely LOVE this space! 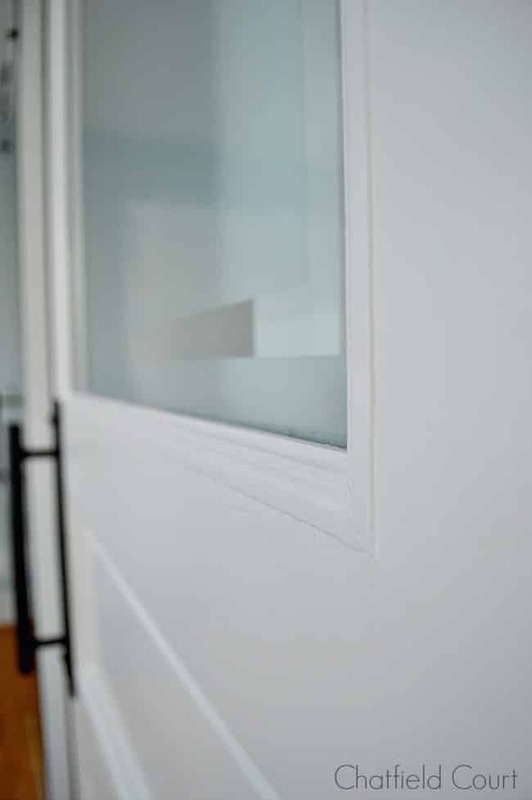 And great call on the “door with a window” idea, can’t imagine being in the space without it. Everything turned out great and you’re truly inspiring. Can you tell me more about the pull you used on the door? 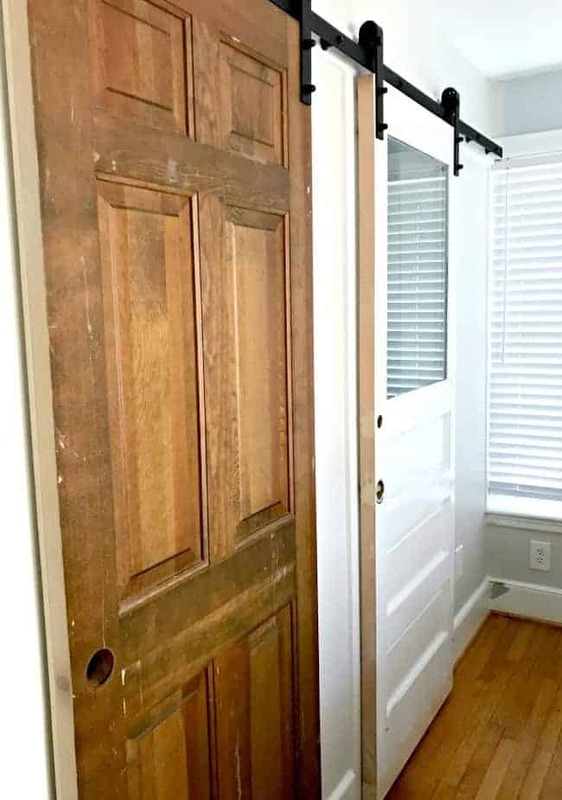 I’m trying to find one with a large backplate like that to cover the holes in a repurposed door but am having no luck. Thanks! Thanks so much, Beth! I’m really thrilled with the way the space turned out, especially with the addition of the door. I found our pulls from a vendor on Etsy. I had some issues with them so I can’t really recommend them but there were others that can make handles and plates like ours. Hope that helps! Good luck with your search. I love this and am trying to do the same thing in my tiny hone in LA. Can you tell me what the denensions are? I am dealing with 31” x 58”. I think I might have to do a wall mounted toliet. Hi Jess! The dimensions of our powder room are roughly 70×30. It was just enough room for the toilet and a tiny vanity. 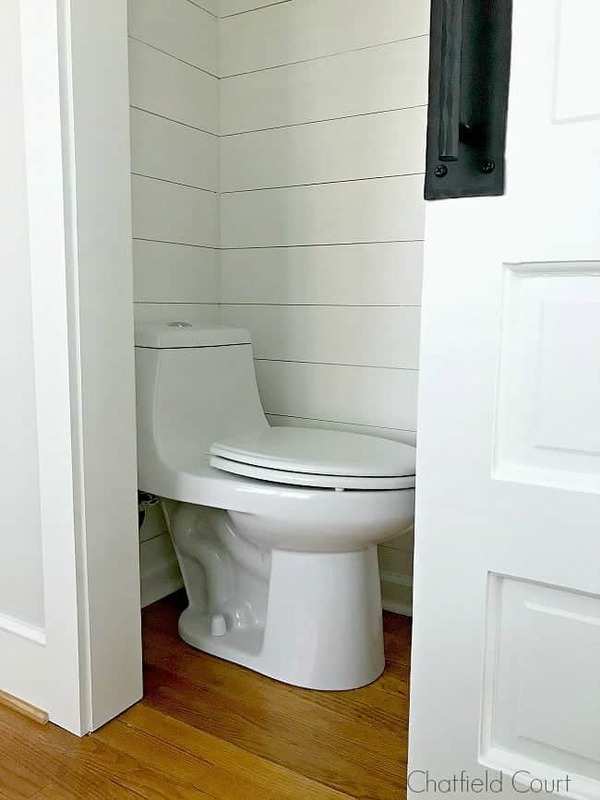 I would say that if you can fit it, a wall mounted toilet may be your best choice. Hope it all works out for you. Thanks! did you ever mention where you got the toilet? 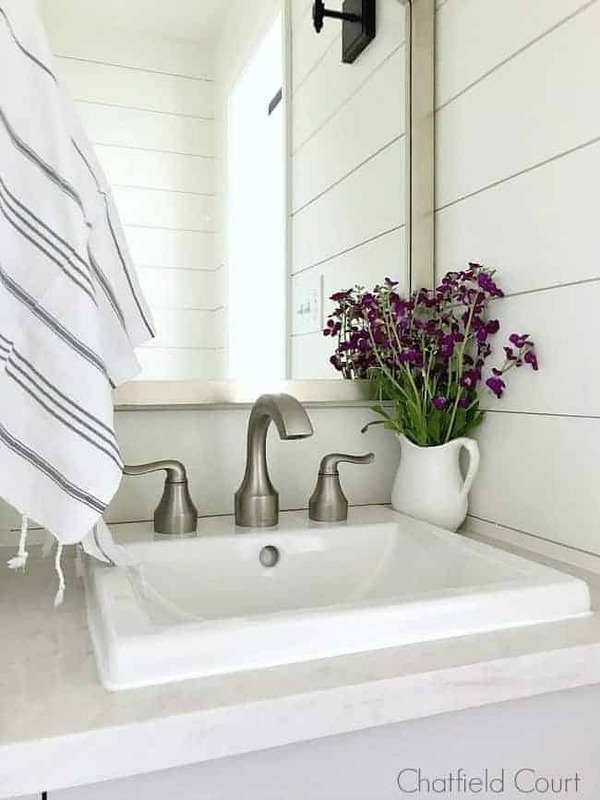 We are looking into doing a small powder room like this and would love to know what toilet you ended up choosing. That is so unbelievable! Every little thing is just perfect! I honestly would have never thought about turning a closet into a bathroom and am inspired to think outside the box in a much bigger way. I have been griping about how small my bathrooms are but if a closet can work I should be able to make mine a vision of loveliness too! But first, I have to get all the straw embedded in the paint scraped off…why, oh why did someone think that was pretty? Straw embedded on a wall? Oh my! Wasn’t that an episode on Trading Spaces? 😉 Good luck with that! The powder room looks fantastic. We are thinking about doing something similar but we don’t know if we have enough space. What are the inside dimensions of your finished powder room? Thanks. Thanks Mike! The inside dimensions of the powder room is roughly 70×30. It’s tiny but just enough for us. Kristi, you guys are so clever, what an amazing space! The frost window door is a great idea, glad you rescued the door! I’m glad that I rescued that door too, Laura. We are really happy with the way our tiny space turned out. What ambition you have . It looks wonderful and your husband must have a lot of patience. God Bless you both. I love it. Thanks so much Susan! 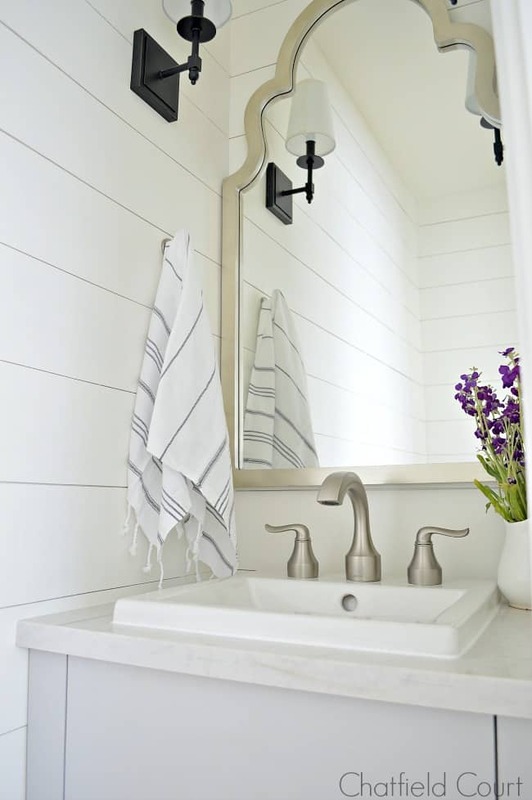 We love this tiny space and it’s so nice to have that second bathroom space in the cottage. May I ask where you found that gorgeous mirror? Hi Rose. I found the mirror at Wayfair and made by House of Hampton. Unfortunately it’s not available right now. Sorry I couldn’t be more help. WOW! WOW! WOW! What an inspiration you are. Your powder room is perfection. Wonderful job and outcome! Saw your feature on A Stroll Thru Life and just had to tell you how great it looks. I’m totally in awe of this project. I own a small (750sq.ft) beach cottage and would like to do the same thing. How wide was your space?? I have the length, but am unsure if a commode and vanity would fit in the width. The door application is truly inspired. Thanks so much Ilene! The space is about 32″ wide. You need to consider the toilet size and check with your town’s codes. We were sweating it until the toilet was bolted in place. It’s definitely tight but there’s plenty of room to sit comfortably. Hope you’re able to fit one in your cottage. You should be very proud of yourselves. It turned out fabulous! Love the doors! Just AMAZING! Thanks for the inspiration. Thanks so much Erin, I appreciate it! It looks great! It’s both pretty and functional in a very small space. Very inspiring! I have followed your blog for a long time but have never left a comment. I just love your decorating style. My husband and I relocated to a new area last summer. The house we purchased is in very good shape except for the 1970’s decor. lol We are having a great time updating a room at a time. Your blog has given me a lot of great ideas and I just wanted to thank you. 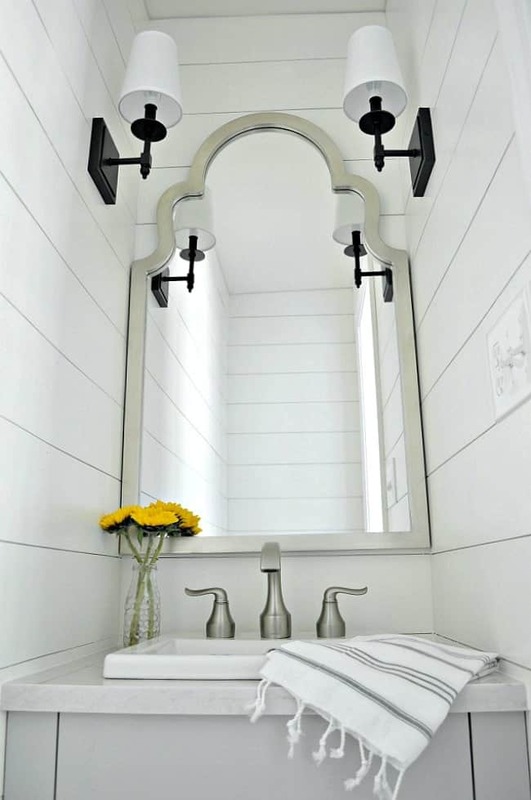 Absolutely love it all…..the shiplap, mirror, vanity, sconces, door….it’s perfect! What a great project! An excellent use of space. I am looking forward to seeing what you will do with the bedroom. A lot work went into this project and it shows. I love all of your choices and finishes. Thanks so much for your sweet comment Julie! We are thrilled with our new space! Very excellent job, the design is pretty and the building talents are impressive, as this looks like it was tricky. Someone has amazing patience. I bet you are thrilled to have this finished. What a great job! So pretty! Could you please show us a picture with both doors closed (with the pwd rm light on)? Thanks so much Rosie, I appreciate it! I sent you an email with the picture you asked for. It is the perfect bathroom. So beautiful. I hope you get in a magazine with your idea. It came out so well. I was so excited to finally see it. Take care. Awww, thanks so much for your sweet comment Tracy! I’m so happy that it’s finally done. It was a very smart use of space and so very lovely. Thanks Linda, I appreciate it! It looks beautiful and you just added a ton of bankable value to your home! It turned out great, Kristi! I wish I had a closet to use for a spare bathroom. The only closet that would be available is way too small. I do like the door idea. Your faucet in there is almost the same as my new one. I had to replace it after about 20 years because it was leaking. Thank goodness my son can do all that stuff. He had it and a J pipe that was leaking done in no time! Can’t wait to see what you do with the spare room! Thanks so much MJ! We are so happy with the way it turned out. If the previous homeowner hadn’t built that closet we wouldn’t have thought to do it. It just happened to be the right size (bigger would have been better but small, old house=small closets). Yay for kids! Glad your son was able to fix your plumbing and add a new faucet. I love what you and your husband have done with this space! The toilet is fine, but your vanity area is as pretty as any in a high end, large bathroom. I don’t have a problem with it – and I understand the logistics – but does your bathroom door have to be open in order to open the closet door? If not, I don’t know how that works. Regardless, it looks perfectly fine to me. Good job. You must walk in there several times just to admire both the closet and the bath. You guys are amazing. The bathroom door does have to be open in order to open the closet. We have it open all the time anyway so it’s not an issue (unless someone is using it). We also put a stop on the bottom of the closet door so it only goes in front of the bathroom opening a little bit. Hope that helps. It turned out beautiful. I have the chance to move closer to my son and am looking at a retirement park near him. The home I have an eye on has a tiny bathroom like this one. If I decide to buy it I will use your bath as inspiration. Going to watch the video. Have a great week. That’s so great that you’ll be near your son. Can’t wait to hear what you decide. 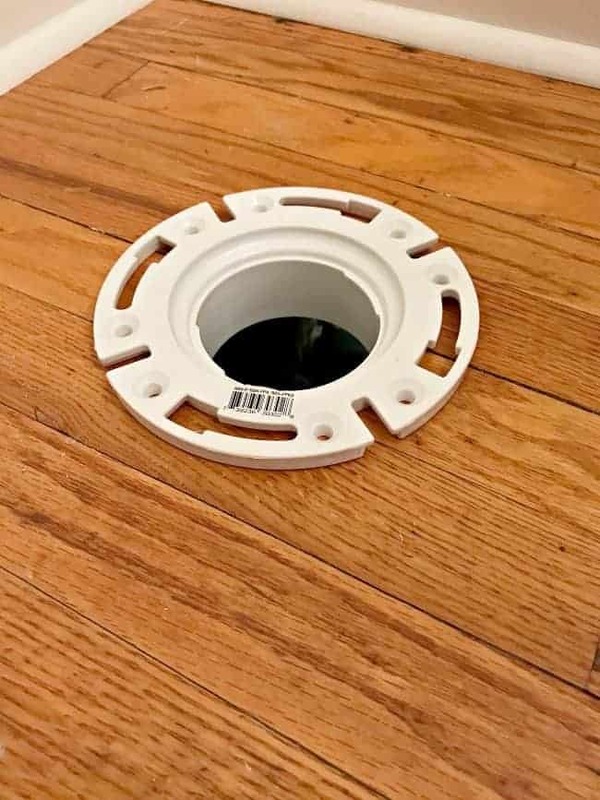 I’ve been following this project from the beginning and have to say “Great Job!” This is wonderful and I’m sure it will get lots of use. That door is super and glad you thought to save it from the rubbish. I think it turned out beautiful . I really love the door. Great idea. Thanks so much Deb! We’re really happy with the way it turned out.